King County is the largest county in Washington state with a population of over 1.9 million people. It is located in northwestern Washington on the eastern shore of the Puget Sound. Major cities within the county include Seattle (the county seat and largest city in the state), Renton, Bellevue, Kent, Federal Way, Redmond, and Vashon Island. King County is between the cities of Vancouver, British Columbia, to the north, and Portland, Oregon, to the south. Seattle is perhaps the best known city in King County and in the Pacific Northwest. It is the site of landmarks such as the Space Needle and the Pike Place Market and is home to Boeing Company aircraft manufacturers. Though there are many large cities in King County, the majority of its population lives in the suburbs and commutes to work; the average commute time is about 27 minutes here. Residents may choose to live in the central or eastern part of the county for a quieter lifestyle and the potential for bigger properties. Homes in King County are about the same average age as the rest of Washington. 4 Beds | 2.5 Baths | 2501 sq. Ft.
5 Beds | 5 Baths | 8010 sq. Ft.
4 Beds | 2.25 Baths | 1857 sq. Ft.
3 Beds | 1.75 Baths | 1406 sq. Ft.
5 Beds | 1.5 Baths | 2180 sq. Ft.
3 Beds | 1.75 Baths | 2240 sq. Ft.
4 Beds | 1.5 Baths | 2180 sq. Ft.
5 Beds | 1.75 Baths | 1568 sq. Ft.
4 Beds | 3.25 Baths | 3010 sq. Ft.
4 Beds | 2.75 Baths | 3300 sq. Ft.
Blue Summit Realty has the most accurate and up to date King County real estate listings on the web. Currently there are 3,572 homes for sale, 1,047 condos for sale, 262 rental properties, and 816 vacant land properties in King County. Of the 5,757 total King County residential listings for sale 22 are bank owned, 7 are short sales and 1,046 are new construction and 50 are townhomes. The price ranges from $90,000 to $28,500,000 with a median list price of $813,810 and median sold price of $631,319. 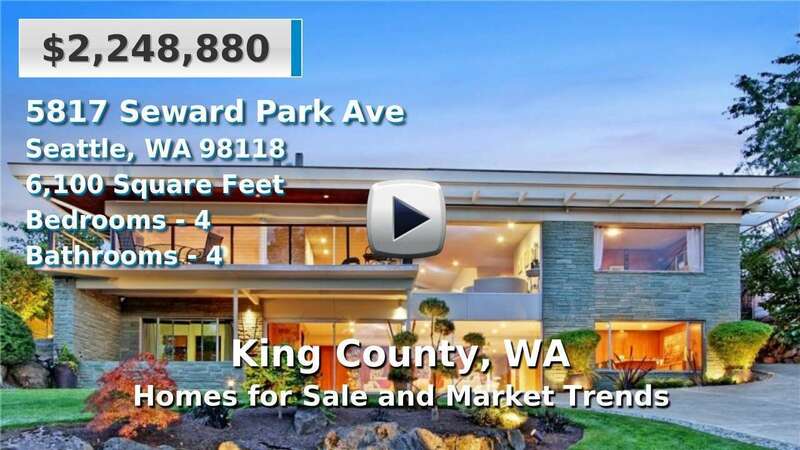 Make sure to refine your King County real estate search by property type, price, square footage, bedrooms, bathrooms and more with the search tool above or view the King County listings on our interactive map. Our King County real estate listings were updated 13 minutes ago.